Lock in a great price for Skala Hotel – rated 8.9 by recent guests! The location! I believe there is not a better location in the entire city of Athens. The Acropolis metro station is literally across the street. As soon as you walk out the door you are in Plaka, with numerous shops and restaurants to choose from. The other major asset of the hotel was the staff, especially at the front desk. Every one of the front desk workers were outstanding and very helpful. Nice quiet stay in good location across from the marina. We were greeted and taken care of immediately by the staff. The hotel site and pool are very nicely decorated with trees and flowers. The room was small but clean with a garden view. The bathroom shower was upgraded and nice and hot. The breakfast was perfect and nicely setup by the pool. The hotel staff is very helpful and competent. The property is situated in a particularly convenient place, being very close to the arrival pier of the port and to the bus-stop to other places of the island. The hotel is not very modern, but for this it preserved some of the charm of days gone by, such as its garden with pool and its entrance via an inner court. Easy access to the beach, restaurants, shopping and public transportation. Staff was friendly and helpful. Facilities were clean. The breakfasts were good. Very nice and friendly staff, always looking out for you to make your stay pleasant. Excellent location , close to port, taxis, beach, shops and restaurants. The outdoor space was peaceful and relaxing and there was plenty of places for eating. The room was very clean, spacious. Excellent location and superb view. The staff friendly and helpful. Everything was great! The staff and atmosphere was very good. Very Close to Everything, the wiev we had from our balcony was very nice. Excellent location - quiet but on the centre of things. Amazing view from the balcony of the monastery and windmills. The staff were friendly and very helpful. The room was comfortable and clean. Skala Hotel This rating is a reflection of how the property compares to the industry standard when it comes to price, facilities and services available. It's based on a self-evaluation by the property. Use this rating to help choose your stay! One of our top picks in Skala.In a garden of bougainvilleas, 150 feet from Skala Beach in Patmos, this hotel offers a pool and a breakfast buffet with local products. The rooms have balconies overlooking the Aegean Sea or the mountains. The air-conditioned rooms at the Skala Hotel are decorated with modern furnishings in bright turquoise and yellow colors. Each unit offers free Wi-Fi and a satellite TV. A mini bar and a fridge are available. Guests can relax at the sun terrace under the palm trees around the seawater swimming pool. The pool bar serves drinks and coffee and there is also a lounge bar with a widescreen satellite TV. Hotel staff can arrange massage treatments, Yoga and Reiki sessions. Baby sitting services are available upon request and free towels are offered at the pool. The center of Skala is 150 feet away and features shops, bars and traditional taverns serving fresh fish. 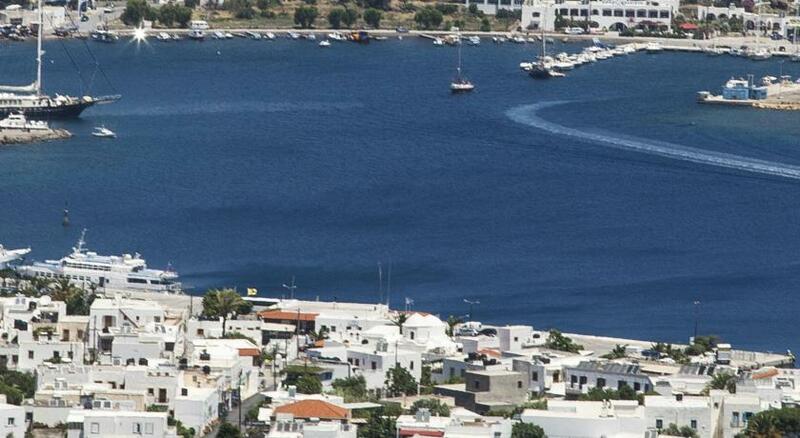 Chora, the scenic capital of Patmos with the whitewashed houses and the castle is 2.2 mi away. When would you like to stay at Skala Hotel? This room features a balcony with mountain or garden view, and comes equipped with a hairdryer, Wi-Fi, satellite TV and air conditioning. Spacious accommodations featuring 2 interconnecting double rooms. This unit can accommodate 2 adults and 2 children up to 12 years old. This room features a balcony with mountain view, and comes equipped with a hairdryer, Wi-Fi, satellite TV and air conditioning. This single room features a balcony with mountain views, mini-bar and satellite TV. The property is spacious with a beautiful garden and many different outdoor spaces where the guests can sit and relax or have a snack. Many rooms overlook the common spaces so the guests have a sense of closeness and privacy at the same time. Despite being conveniently close to the town centre there is no disturbance whatsoever. House Rules Skala Hotel takes special requests – add in the next step! Skala Hotel accepts these cards and reserves the right to temporarily hold an amount prior to arrival. Please note that Skala Hotel does not accept American Express cards. Excellent location, fantastic sea-view, very kind staff, delicious traditional buffet breakfast. We like to swim before breakfast and found the 9am opening of the pool a little late. Our room was quite large, very nice and it had a balcony. The staff was smiling and very helpful. The bathroom was new and there was lots of space to place our toiletries. Air conditioning was perfectly functioning. Great position! 24h night concierge. Facilities are a little dated. Nothing as my experience was wonderful. A warm hospitable and friendly greeting upon arrival. Clean and comfortable room. Great breakfast. Excellent location as it is central to everything. Thank you for the great experience! The beds! They had rather thin mattresses and were on wheels, so moved around a bit. Excellent location, good spacious room. Enjoyable breakfasts. Very friendly receptionists. Nice view from our room. Very old fashion decoration of the main room and the bathroom Very old fashion decoration of the whole building. Although the building and the rooms are quite comfortable, unfortunately the facilities and decoration are so poor. Regarding breakfast, it was completely poor in terms of variety and quality. Furthermore, the staff there didnt care at all about the equipment as many of the plates and bowls were broken. We payed 180 euros/night to end up in a room with torn bed sheets, torn towels, a bed almost falling apart with the worst quality mattress. Moreover we found cockroaches twice in the room. There were also electricity problems. Asking around we realized that we payed twice the market value for a very bad room. Breakfast was basic too. Great location and very accommodating and comfortable.